There’s only one show on Friday night. It’s so nice. CMLL Claro will have the final of the incredible pairs tournament, which will probably be pretty good. Niebla Roja & Soberano has a chance too. In usual CMLL form, it’s one of two Soberano lightning match this week, with another on Monday. AAA posted their TV plans, so those are probably correct guesses. CMLL hasn’t announced a Tuesday lineup yet. Mr. Niebla, Pierroth, Rey Bucanero beat Guerrero Maya Jr., Marco Corleone, Stuka Jr.
Mephisto versus Titan is as good a title match which will happen in Arena Mexico all year. The Volador matches may be more spectacular, but titan brings more of an exciting rollercoaster to his matches. It’s not just the big moves, though there are absolutely big moves in this one. It’s the fast small moves, the submissions that might actually, the back and forth counters and escapes. Titan big title matches are full of drama that’s not just limited two-and-a-half counts. It starts off strong, with Mephisto surprisingly cutting off a normal opening fall sequence to Titan in a submission. It did feel like a fall blown thru because they don’t really want to do three falls, it felt like Mephisto made a smart move and forced the match to end early. That also made Titan as the underdog for the rest of the match, both on the scoreboard and just from getting pummeled for the next half of the second fall, and rallying back from a deficit is where he excells. He’s also gotten really good at pulling the fans into his matches. The crowd was way into this match from the double dive spot on since it came so fast and spectacularly, but he still worked at rallying them as he was going for his (doomed) headscissors of the apron. It doesn’t feel forced, it feels like he desperately needs that support. I thought they went back and forth in interesting ways, not just relying on the big kickouts to get a reaction. It was smart to not just do the Super Devil’s Wings the first chance they had, because it made Mephisto actually connecting on it the second time feel even more sure as a match ender. Titan got something out of it even if he didn’t last much longer. I don’t think Mephisto added a lot besides doing his signature moves a few times and being in the right place, but that’s all he needed to do with Titan. This is an easy recommendation. The fourth match featured Rey Cometa looking the wrong way in a group pose and Shocker & Hechicero having a mid match rock/paper/scissors contest (both went scissors on the first try, Shocker won with paper over rock on the second), so it was not the most serious affair. It was pretty fun CMLL filler, with Triton capable of doing some incredible things. Hechicero set up Shocker’s spear to look great in the end. Cometa is full on committed to being a goofball at all moments – his wacky dance was one thing, but he also exited the ring by laying on the middle rope and falling over to the apron. The tercera was better than usual. There were a few moments of awkward waiting but the pace was really good otherwise. All that teaming with the Panthers has taught Pegasso that the key to happiness is doing a lot of topes in a row, a lesson he tried to pass to his partners here. Magia Blanca suffered a lot in this match. He’s also as good or better than Universo Junior. Universo is greatly benefiting from his name and height at the moment. The women’s match had a hilarious bad ending to the second fall, where Metalica went up top for the flip senton only to find Tiffany had pulled Silueta too far away to do it and just decided to do nothing. Marcela is wearing gear with “CTFRM” on it and I don’t know what that means. Tiffany pulls Silueta too far away, Metalica decides she can’t do her senton. The next minute is them arguing with each other and Edgar about who’s fault it was. At least they care! The opener wasn’t far off the better Friday minis match, for better or worse. The crowd wasn’t much into it at first, but Stukita put on a good performance and Shockercito was trying. On Informa yesterday, Cuatrero & Sanson announced they’ve vacated the Arena Coliseo Tag Team championship and are entering the CMLL World tag team tournament. It’s unclear why they would have to give up the other set of tag belts to challenge for this one, except CMLL wants to move those belts onto someone else without having the NGD lose. It is clear they’re still going to lose, since Cuatrero & Sanson are obviously not advancing to the final since it’s on Homenaje a Dos Leyendas and Cuatrero is facing Angel de Oro in a mask match on that show. It would take five seconds to say “if Cuatrero (or Angel de Oro) advance to the final, we’ll hold the tournament final on a different day”, but that apparently is too costly a five seconds for CMLL to spend on making sense. CMLL’s press release on the situation makes it sound as if there will be a match for the vacant Arena Coliseo Tag Team Championship, not a third tag team tournament. We can only hope. The CMLL Teleformula show is being called “A Ras de Lona“. 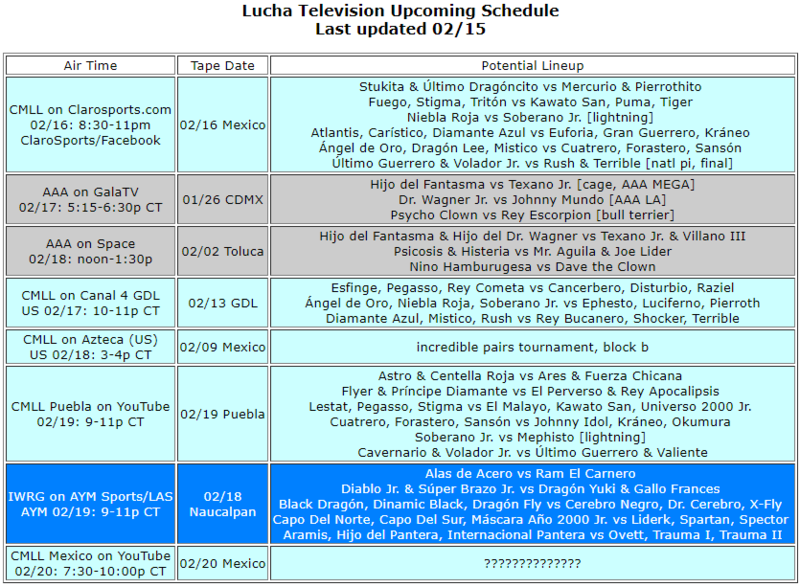 At least for the first couple weeks, it appear to be airing the same exact matches that CMLL is airing on Azteca USA. AAA’s partner in Monterrey, KDNA, says they’re hosting a TV taping on March 25th. If that’s correct, that means AAA would be taping (and airing on Twitch) three times in eight days. They’d start with a Cuernavaca taping on Saturday, go to San Luis Potosi on Wednesday and end up in Monterrey. It would also suggest many matches will end up being Twitch exclusive, because be taping too much material to air unless they get a longer time slot. AAA has a press conference today in Puebla with Fantasma & Texano to talk about their Rey de Reyes apuesta match. There’s a chance we could find more about that show’s lineup. They’d probably have announced it if not for the Rey de Reyes qualifying matches coming up and they may still. The winner will be decided on Saturday’s Arena Neza show. I’m guessing Cobre. Whoever told “Rey Volador” to go with that name, be it himself or his trainer or his friends, is doing him a disservice by letting him use a generic name. The Montanez are said to be MMA fighters, so this is a mixed style match. I couldn’t find anything about them with a quick search and they didn’t turn up in Sherdog’s Fight Finder. The Crash announced Penta 0M vs Austin Aries at WrestleCon on 04/06. The WON reported it’s unlikely Rey Misterio Jr. will be on this show – not because of a WWE deal, but because he’s currently scheduled in England the night before. The Gladiatores has a fuller report on the Baja Callifornia awards. Black Danger vs Arkangel Divino on 01/21 won luchador of the year and Black Danger was awarded luchador of the year. It does seem like only those licensed thru or belonging to Baja Calfiornia were eligible, which probably reduces the amount of The Crash matches which could be picked. +LuchaTV talks to Terrible about advancing to the tournament final. LuchaWorld had the latest news update. Segunda Caida reviews Lucha Undergorund episode 3×31. El Malayo, Fuerza Chicana, Perverso beat Arkalis, Black Tiger, Tigre Rojo Jr. Nothing in storyline. In reality, Vangellys blows out his knee catching a Valiente dive about 30 seconds before the finish and will be out for most of the year. Everything is going to come off more critical than usual in this one because I’m taking a different approach to the GIFs. Instead of GIF of interesting things I saw, maybe I can use them illustrate what I saw. That’s ten seconds of everyone just standing around lost. That shouldn’t be happening in a four person match with veterans. I’m not even sure who’s fault it was. Isis has improved in some ways but she’s not going to be good until her timing drastically improves. Let’s watch Maravilla come to a screeching halt waiting for a plancha. Almost everyone does it to some extent. Triton waited to do his guillotine legdrop in the next fall until he was sure Luciferno was frozen in place, which made it totally awkward. Isis seems worse. Isis is no newbie at this point. She’s had the experience and hasn’t improved enough at that aspect. The tercera built well, though was clumsily at times. Ephesto has trouble keeping up. My biggest problem with these match is I really dislike the Esfinge & Triton matching gear. It’s just way too busy to my eyes. The action was generally fine in the semimain, but it didn’t coalesce into anything interesting. Hechicero’s ability to mesh with his teammates is normally one of his great strengths. He didn’t do that here, not really getting along with his partners more wild antics or playing the patriotic Mexico rudo who didn’t agree. He was just in his own match. If Johnny Idol ends up getting over in this new role, he ought to send Sam Adonis at least 5% of what he makes. Idol’s wrestling is still as iffy as ever. His missed superkick on Titan audibly deflated the crowd. The personality switch wouldn’t have met as much if he was doing in isolation; he needs the evil foreigner character more than Adonis does now. This is up there with them choosing the angle that shows Dragon Lee kicking the turnbuckle every time. Vangellys injury happens really fast and isn’t even that graphic. It’s occurs just in an instant – his left leg slips a bit and all of his and Valiente’s weight are on his right knee. Vangellys immediately knows he’s in trouble, and Bucanero and Valiente do their best to make sure doesn’t land Kraneo doesn’t land on him too. I guess it’s theoretically possible there were some big Vangellys plans which were scrubbed. More likely, since the finish was Terrible unmasking Caristico, there were two weeks of these matches just to fill time. It would’ve been nice had they figured out a more interesting to fill time, but being interesting isn’t the priority.